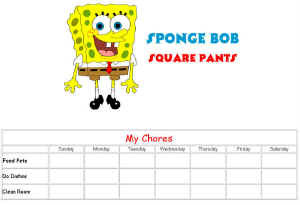 Our custom chore charts will allow you to create and print a themed chart that you can hang on the fridge or wall to help remind your children of the chores they need to take care of. You add your own title to the chart and then customize the row and column headings. Choose a picture for the top of your chore chart from a variety of themes. You can create your chart in color or black and white so that you child has something to color before hanging it on the fridge. Enjoy! "I wanted to suggest that after you've created your chart you can get your child to color it and then get it laminated so that you can just wipe it clean every week. Saves a lot of paper in the end and it only cost a couple of dollars to get it laminated." "I just wanted to share how I use your Custom Chore Charts. I do not have any young kids in my family but I am trying to improve my physical strength in the gym. I decided to use your Chore Chart idea and use the step by step creator to make a workout tracker. I pick a theme I like and for the top headers for the days of the week, I put Week 1 through to Week 4 and each 'chore' row is an exercise I want to improve on, such as bench press and pull ups. I find that it helps me stay on track as to what I need to be doing in the gym if I want to improve my physical strength. At the end of the four weeks, I get to pick a reward, such as going to my favourite restaurant, as long as I get at least one star/check mark for each exercise for the four weeks.."